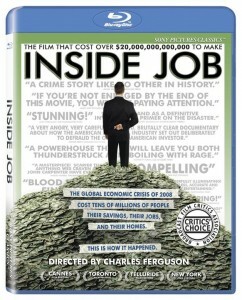 You are here: Home / Documentaries / Inside Job: A story about people who aren’t as smart as they think they are. Over the past couple of years I’ve started but never finished several books about the financial meltdown. I had the best intentions, as did the authors who wrote the books. But everytime I got to the section on credit default swaps, derivatives, and collateral debt obligations I found myself nodding off. Add to this an inability to connect the many people behind the meltdown with their names on the page, and it’s easy to see why this is a hard topic to tackle for a book. But what these books were unable to do for me, this film has done expertly. Having lived through the meltdown, I was familiar with many different parts of this story. I knew about Iceland’s big gamble; I knew what CDO’s were; and I was familiar with many of the people involved. This film ties everything together and walks you through the process step by step. Along the way you gain insight that no other medium can achieve. The one thing a film like this does is that it exposes people. It’s all there: out-of-control egos, greed, incompetence, arrogance, and outright criminal behaviour. The fact that the very people responsible for what happened are the least affected by their actions is appalling. The film points out so many instances of CEOs who had no clue what they were doing, being rewarded by equally clueless boards, that you lose count. These guys are criminals. They stole millions of dollars through excessive pay and bonuses, and the selling of stock only months before their companies went bankrupt. Someone needs to go after them and get that money back. Charles Ferguson, on the other hand, isn’t afraid to go after anyone if they were culpable, and I applaud him for that. There is plenty of blame to go around: the rating agencies, the financial institutions, the so-called academic consultants (I’m talking about you Martin Feldstein and Glen Hubbard), and key government people like Alan Greenspan, Bernanke, Heny Paulson, Larry Summers, and the list just goes on and on. Everyone points the finger at everyone else and no one takes responsibility. These CEO’s and economic professors are no different than anyone else. They’re certainly not any smarter, unless you consider stealing money and getting away with it is a measure of intelligence. Even the Obama administration takes a hit. And I’m sad to say that it is deserved. I’m a fan of Obama. He has a lot on his plate, and I think he’s doing a hell of a job with the cards he’s been dealt. But he has dropped the ball on this one. Not only hasn’t he instituted any of the reforms he campaigned on such as excessive compensation and regulatory oversight, but many of the same people who were responsible for the crisis are still there. He hasn’t done one thing to go after the CEO’s who walked away with millions while everyone else lost everything. This film is so chock full of insightful information that I watched it twice. The second time was with the audio commentary by Ferguson and one of the film’s producers. I sometimes skip ahead with audio commentaries, but not this one. There were too many interesting behind the scene details, like the fact that getting the rights to a Peter Gabrial song used in the opening cost 5% of the budget. 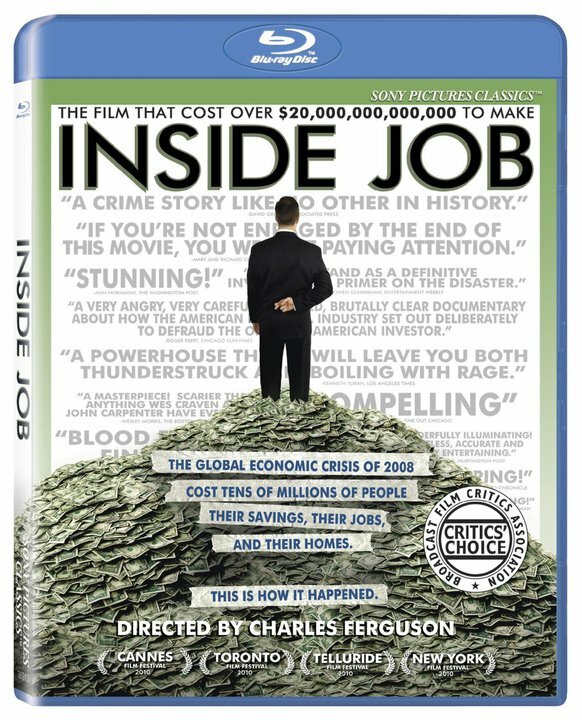 Lastly, as good as this film is (it won the best documentary Oscar this year) the official website www.insidejob.com is beyond bad. The layout is confusing, the information about the film is sparse, and they seem to be trying to invent their own social media platform with member sign-ups and badges. All in all it’s a total mess. Watch the film. Don’t waste your time on the website.